My Favorite Moments at #FinCon11! 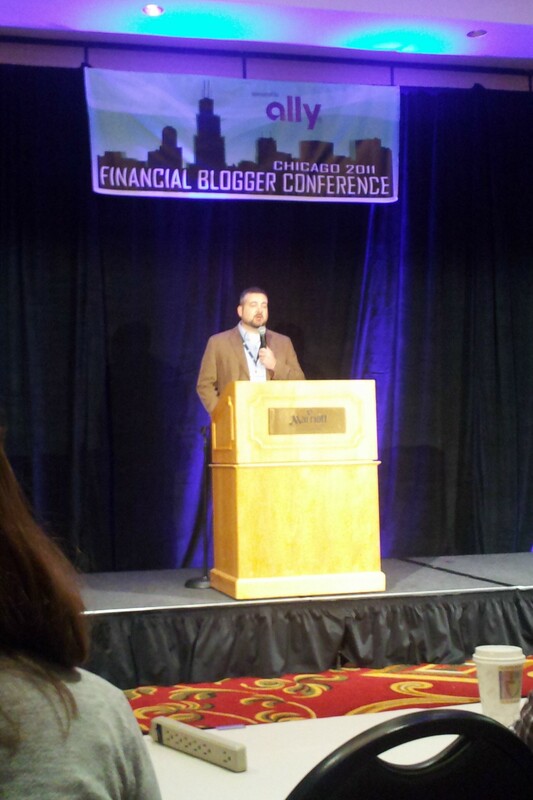 If you read many personal finance blogs you couldn’t have missed the fact the first Financial Blogger Conference occurred last weekend in the Chicago area. Regular readers know I attend blogging conferences several times a year. This one ranks up there with my two favorites (BlogHer and Savvy Blogging Summit). It was an entirely new experience being in the same location with 250 of my favorite writers. They inspired me to start Bucksome Boomer and it was hard not to be star struck! I’ll share takeaways in a later post. Before I forget them (if possible) here are my top ten favorite moments at the Financial Blogger Conference. 1. Transportation: Not only did I use miles so my airline ticket only cost $7.50, but I shared cabs to and from O’Hare with other bloggers. Frugality at its best! Thanks to my cabmates: Jenny from The Jenny Pincher, Todd fromFinancial Mentor and Hunter from Financially Consumed. 2. Getting Free Consulting: My friend Len Penzo cared enough to give me advice on headline writing. Thank you Len, I’m already working on it. 3. Best Roommate: Crystal from Budgeting in the Fun Stuff agreed to room with me many moons ago and I hope she doesn’t regret it! She is as kind, high-energy and fun in person as she seems online. 4. Reconnecting with Pat Flynn and Adam Baker: I was fortunate enough to meet both Adam and Pat earlier this year on the Man Vs. Debt tour stop here. The fact that they both remember me was fantastic! I treasure the insight, advice and budding friendships. 5. Chatting with JD Roth: Walking into the hotel I saw JD chatting in the lobby with a group of people. An hour later, I was in that group catching up and learning from the discussion. JD was gracious and available throughout the conference for anyone who wanted to speak with him. He even reminded me Sunday morning that my guest post was up at Get Rich Slowly. What a rock star blogger! 6. Hugs: The connections we make online are genuine and nothing says it like being greeted with hugs! First there was my conference BFF, Danielle from Kitten a Go-Go. Other huggers there included Donna Freedman and Dr. Dean. The best hugger of the bunch is J. Money, no doubt! 7. Yakezie Pizza Party: It was hard to find time for Yakezie members to connect as a group during the conference. The agenda was packed and we didn’t want to miss a thing! Jason from Live Real Now ordered several pizzas. Those that showed up pitched in and ate up! After getting kicked out of the lobby (boo), the party moved to Crystal and my hotel room. Loved the vibe chatting about anything and everything including a little bit about blogging. 🙂 . Our pizza party included: Squirrelers, Money Reasons, Khaleef (with his lovely bride) from Faithful with a Few, Beating Broke, Briana from 20 And Engaged, Kris from Everyday Tips and Thoughts, and Jesse from PF Firewall. We even had an honorary Yakezie member, Julia from Bargain Babe. 8. Networking: It was not possible to meet everyone there (no matter how hard I tried). However, I was thrilled to meet Silicon Valley Blogger from The Digerati Life the first evening. She is charming, friendly, fun and we are already planning a California blogger get-together. Flexo from Consumerism Commentary and FMF from Free Money Finance are as personable in real life as they are on in the Yakezie forums. A big thank you to Pinyo from Moolanomy who offered to share a cab (our timing didn’t work) and publish a guest post. Thanks to Will Chen at Wise Bread for your affirmation and kind words. It was great meeting all three founders! 9. Plutus Awards: I didn’t win in the two categories nominated, but it was fun to see the winners walking around with their award(s). J. Money and JD mopped up! Thanks to Flexo for coming up with the Plutus awards and taking on the work involved. 10: Conference Organization: It wouldn’t be right to not share the fact that this was one of the best organized conferences I have ever attended. Everything started on time, the agenda was content-packed with great speakers and there weren’t any snafus (that I saw). Kudos to Phil from PT Money and his team. I will register for the next Financial Blogger Conference as soon as it opens up; this conference is a no-miss for any finance-related blogger. I am really po’d that jmoney won the “hug” award too! That is a challenge for next year-watch out! It was great to get to know you better-don’t come to the southeast without calling-we’ll get together! So is Danielle! Your hugs were good, but J. Money is a major hugger. Kay Lynn, thanks so much for sharing your memories. I can’t wait for FinCon12. I’m definitely going!!! I can’t wait to meet you at the next one; I’ll hold you to it! Ashley, I definitely will. I didn’t even realize you were in the state. Man, I’m bummed I missed the Yakezie pizza party. Granted, I’ve been a terrible Yakezie member this year, so I wouldn’t have known about it. I love the members of that network! I also can’t wait for FinCon12. Next year I’m going to do some better networking in advance, but even so this year was great. Hopefully my blog will be better known by the event next year… I got so many great tips at the event on how to become a better blogger. See you next year! We did talk about the party in the forum, but I probably would have missed it if it wasn’t for Crystal. Sounds like such a great time. I really hope to go next year. Actually I’ve already made up my mind. I’m going! Niki, you must go if at all possible! It was so valuable, but I’ll be busy for a while putting everything I learned into action. What a time that was! I am signing up as soon as Philip announces the venue. Donna, I’m so glad you were there despite the trials you went through on the way. I hope not to repeat any mistakes you highlighted in your presentation. Phil, it was a blast. Time went so fast because it was all great! Thanks for thinking of us for next year. It was great meeting you. I wish we had more time to talk. And I missed out on the Yakezie pizza too! How did you guys get kicked out of the lobby? I know there was a group of folks there pretty late. Glen, we started out in the lobby but were kicked out for the awesome pizza we were eating. FWIW, Lou Manati’s pizzas are great! It was great being able to meet you! Getting kicked out of the lobby and having to move our pizza party was one of the best parts of the conference for us! Your wife is fantastic! I hope to get to interact with her throughout the year and I’ll give both of you big hugs next year. Thanks, I’ll just plan on using miles for this conference each year (that and BlogHer). See you in August in NYC. Great chatting with you in the cab Kay Lynn. Pizza party was fun too. It was fun and I left you off the list (so sorry!). I knew I was forgetting someone…. I will definitely be signing up for the next one. Can’t wait! Thanks for sharing some highlights. Sounds like a blast. It was fun, but very intense with so much content and networking going on. Cool recap of an awesome event! Was the conference more productive or fun? I would say more productive. BlogHer by comparison is more fun. I learned so much, and there is so much I stil have to learn and implement. One thing I do know is learning is a lot more fun when there is a great group of people with you! I was really glad to finally meet you in person. I agree that it probably should be on the west coast next year given how many people there were from the west coast. Doubt I will be able to make it, but fair is fair! Love the new layout! So great meeting you at FINCON11! Hope our paths cross again soon. Previous post: What’s the Right Mortgage for You?